Taylor's Sweet Little Art and Nerd Site: Teenage Mutant Ninja Turtles 2012 Toy Review! Teenage Mutant Ninja Turtles 2012 Toy Review! It's been a while since I have done a toy review on here. Honestly, I had not planned on doing another, but the toys I am reviewing today are so great, I couldn't bring myself to not review them! "What are the toys?," you ask. The toys I'm so excited about are Playmate's Teenage Mutant Ninja Turtles (2012)! Ever since I saw pics of these guys from this year's Toy Fair coverage, I've been pretty excited about getting a set of the turtles. I had been waiting to see when they were going to be sold at stores. They just launched to shelves this last week and I have to say, They were worth the wait through the summer! Lucky for me, I got some of the turtles as gift from a friend! So, this little review has just become affordable! Yeah! First off, let's talk about the package. The package is very bright showing the traditional turtle green and now purple. The logo work is reminiscent of the old logo work of Peter Laird and Kevin Eastman comic books. That is a HUGE plus for me being a big TMNT fan of the comics. Each turtle is posed uniquely in their package and overall, they all look phenomenal! I had a hard time debating with myself on if I wanted to take them out of their package. In the end, the wise words of a ten year old made sense, "Those are too cool to not take out of the package". This is a very wise ten year old. One of the first things I noticed with each turtle is that they don't share a lot of reused parts. Each turtle has a unique body; from the head to the shell. Normally you wouldn't get this kind of detailing with an action figure line. I really like this. The turtles are all different heights. Mike is the smallest, Don is the tallest, and Leo and Raph are in between. I'm not sure how I feel about Mike being the smallest one, but it's not something that really bothers me. The color palette on these guys are also really good. The tones of greens, browns, and beiges are earth toned enough to give the nice turtle coloring, but the colors are bright enough to give a very bright comic book/cartoon feel. The detail sculpting on these guys is really good. Ok, it's better than good, it's great! The articulation is nice. They have 11 points of articulation, and that's pretty good for a 4 1/2" action figure. They have ball hinged shoulders, elbows, thighs and knees. They also sport a ball jointed neck and swivel wrists. My one true complaint on the articulation is that I would have loved to see the ankle on a ball joint. I think that would help with poseability. Ninjas don't tipping toe. Each Turtle also sports a belt with working holsters. I like all of the holster/belt work, but I would have liked to see more holster pieces that would hold all of their extra weapons. 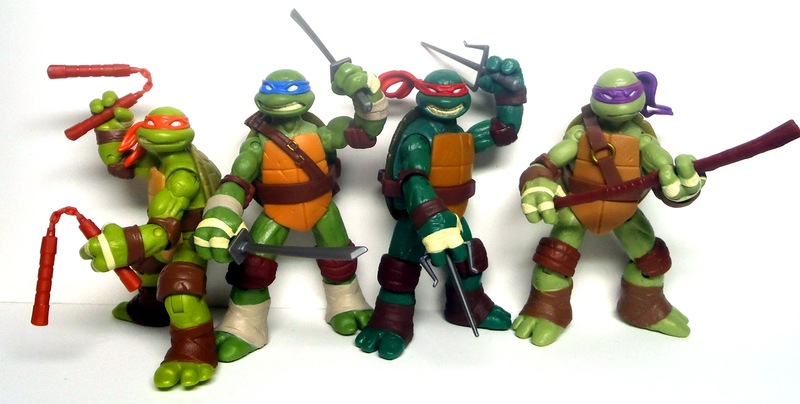 All of their main weapons fit well in the turtles belts, except for Michelangelo's. If you try and fit his Knunchucks in his belt, it leaves stress lines on the plastic where the chains are on the knunchucks. I did it oncet and was afraid I would break them. Going back to the extra weapons, one of my good friends, Jeff, has a rule about action figures; No action figure should have more weapons/ accessories that what they can hold. These toys break that rule, BADLY. With the original release of TMNT, each toy came with a load of extra weapons, but on the weapon sprue, the weapons came with a rack for you to put the turtles' extra weapons on. I like that the weapon sprue has come back, but I feel that there should have been a weapon's rack added. It would help with the display option. As of now, there is too many weapons lying around. So, all in all, these guys are pretty amazing! The sculpt and detail work brings the cool factor up for the overall awesomeness of these action figures. My one big complaint is the lack of ankle articulation and I also wish that there was a weapon rack for the extra pieces. But, Playmates has out done themselves with this version of the Ninja Turtles, which surprises me considering the last couple of bombed toy lines they had: (2009) Star Trek and Terminator Salvation. Both of those lines were pretty bad. These new Teenage Mutant Ninja Turtles toys are about $8.00 to $9.00 per character and are in stores now. I think that these guys are well worth the price and I would give the toys a 4 1/2 of of 5 turtle head rating. Wicked Tight! Sketch Card of the day- Faker! Sketch Card of the day- Extendar! Sketch Card of the Day- Dragstor!